A lot of Persian food that I've made so far looks like it would be served on festive occassions or in restaurants; I mean Fesenjoon, for example, takes around six hours on the stove to cook to its traditional quality! So what do Persians eat at home when they are in a hurry and simply don't feel like waiting for hours until their Fesenjoon or Ghormeh Sabzi is stewed through? 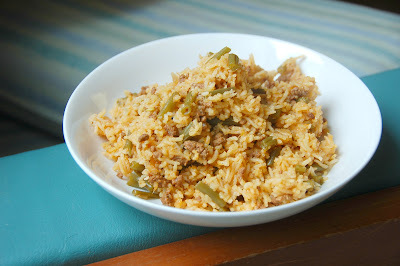 The pilaf, or "coloured rice" as it's called in Persian, can be made year round. If you freeze the sauce in advance, it can also be made in less than 20 minutes. The sauce is pretty versatile, too: some people, for example, replace the beans with diced fried potatoes and call it Estanboli (Istanbul Pilaf). Others prefer to use chopped pieces of beef instead of ground meat to get more texture; it's also more traditional, but won't be as homogeneous a mix as this version. Either way, it's yummy. Oh and it goes well with Mast-o-Khiar, or Doogh. Boil 2 cups of water in a saucepan. In the meantime, cut the tails off the beans before chopping them into 2cm long pieces. Add beans to the water, along with 1 tsp salt. Cook until beans become completely soft, around 20 mins. Drain and reserve. Heat oil in a skillet over low heat. Add onions and turmeric, and fry until onions become light brown in colour. Add ground beef to the onions and fry over medium heat until it changes colour. Add in green beans to the mix. Stir for 5 mins. Lower the heat. Dissolve the tomato paste in a cup of boiling water and pour it over the beef mixture. Stir through until the water evaporates. Add salt and pepper to taste, and turn off the heat when most of the water has evaporated, leaving a paste-like consistency behind. Reserve for later use or freeze to store. Transfer the rice and water to a pan and heat over medium-high until the water boils. When the water is reduced by half, stir in the sauce in batches. Remember the rice should still have enough water or else it will become difficult to mix in the sauce. Wrap the lid of the pan in a towel and cover the pan. Reduce heat to medium low and let the rice steam for 20 minutes or so. If you'd like to have a thicker rice crust, steam for another 10 minutes. And it's as easy as that!